The news on climate is dismal: Polar ice caps melting, fires, floods and droughts increasing, crops failing. Scientists warn of an approaching tipping point beyond which global warming may be unstoppable, with catastrophic consequences. Americans are slowly beginning to grasp this, but few know what to do about it. Mary C. Wood has an idea, though. Wood, an environmental law professor at the University of Oregon, has developed a novel legal framework to confront the global warming crisis in the courts. Wood's work begins with the public trust doctrine, an ancient legal principle laying out the duty of government to protect natural resources for present and future generations. Wood's premise is that the atmosphere, like all natural resources, belongs to the people as a natural trust administered by the government. She argues that government is failing in its obligation as trustee of our atmosphere, using scientific evidence to prove her point. She proposes using the public trust doctrine to bring "atmospheric trust litigation"in court. Successful lawsuits would require that the federal government act immediately to curb global warming. 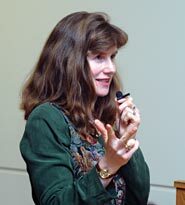 On March 6, she presented her work at the 2008 Public Interest Environmental Law Conference in Eugene, Ore. The response "was like a light going on,"says Wood, with 30 attorneys forming a committee to use her work to bring atmospheric trust lawsuits nationwide. Mary Wood is a mother of three, a fourth-generation Oregonian and a passionate defender of Western landscapes. HCN visited Wood at her home in Eugene to talk about her work, her motivations, and her thoughts about our chances of controlling climate change before it is too late. The federal government has a duty to protect the atmosphere, says Professor Mary C. Wood (left). In Los Angeles (shown above) and other Western cities, greenhouse gas emissions make smog even more deadly. High Country News: Can you summarize the legal approach that you are working on for reining in climate change? Mary Wood: I characterize the atmosphere as an asset that the people own in common. The government is a trustee of that asset. This approach has a basis in our environmental law. You can even think of it as an attribute of sovereignty ... that is, the duty of government to protect our natural resources. The atmosphere is one of those natural resources. In fact, it's the most crucial resource in our trust, because it holds everything else together. So while courts haven't focused on climate change so much ... there are many, many cases which say clearly that government must protect our wildlife, our waters, our streambeds and so forth. Once you characterize the atmosphere as a trust asset, the next question is, what is government's obligation to us, the people? Well, government doesn't have political discretion to allow our trust to be destroyed. ... So government has a strict fiduciary obligation (duty as trustee) that the people have forgotten about. And that obligation now, thanks to the scientists, can be translated into specific terms that the people can enforce. The Union of Concerned Scientists ... just came out six months ago with a clear prescription for returning our atmosphere to climate equilibrium. Now even that prescription is probably not enough, because of the recent polar ice cap melting data showing that climate is unraveling much quicker than scientists believed even seven or eight months ago. But nevertheless, (it's) a good start. The prescription is to arrest the growth of emissions within two years, bring emissions down by 4 percent a year thereafter, and finally achieve 80 percent reduction by 2050. And more recently, I've been talking to scientists who've said you have to keep going and achieve zero carbon emissions ultimately. ... So that is government's fiduciary obligation. HCN: Let's turn now to the specifics of the atmospheric trust litigation. Wood: The other piece the public needs to understand is the concept of orphan shares. That is, every single level of government has to reduce carbon (emissions from all sources within its jurisdiction). Otherwise, it leaves its share on the table without anybody taking responsibility for it. I call that an orphan share. If we have any significant orphan shares left out there, we can't reduce the carbon in time to prevent catastrophic climate heating ... because no other government is going to take a deadbeat sovereign's orphan share. So virtually every city, county, every state, every nation must accept its own responsibility for carbon reduction, and that's not happening right now. ... There's a patchwork quilt of carbon reduction and people are treating this as a political choice. It's not. ... The scientists have defined the fiduciary obligation, and now it's up to every level of government as trustee to carry out that fiduciary obligation in a uniform manner so that all of the carbon reduction will add up to the amount we need. So this is a matter of carbon math. It all must add up, and if there is a piece missing it won't add up. HCN: And you believe the way to do this is atmospheric trust litigation? Wood: Well, that's only one piece of it. The trust approach ... is part of an overall paradigm shift which demands that our government, every level of it, start protecting the resources that we, the public, own. ... (This awareness) must happen in the communities, the agencies, the churches, the schools, all of that, and in other countries as well. The atmospheric trust litigation part is a road map for citizens to bring suit against their government, (whether) city, state, or federal, to enforce the fiduciary obligation. We still have three branches of government in this country, last time I checked. But the courts have been passive observers to this monumental destruction that now threatens, literally, the future of human civilization and our children. The courts ... must provide a check against runaway politicization by the other two branches. They have been on the sidelines in climate crisis. So this atmospheric trust litigation puts the courts as the appropriate enforcers of governments' basic duty. HCN: So how would it work? Wood: The court would declare this trust obligation, which is well-rooted in law. And then it could craft a declaratory judgment, setting forth these principles. That alone would go a long ways, because suddenly the public would have clarity on its own government's responsibility. But second, a judge can order an accounting against any level of government. An accounting is a very standard tool ... and it basically means the government would have to measure its carbon footprint, which is very feasible these days, and it would have to show the court that it's reducing carbon in accordance with the scientifically defined fiduciary obligation. So a court would not tell the jurisdiction how to accomplish carbon reduction. That would be up to the political branches, and the citizens. But the court would enforce that carbon reduction, and have a method by which the citizens can know whether their government is squandering their future ... or protecting their resources, through this accounting. And finally there could be injunctive backstops. If the officials do not perform as trustees, they would be subject to contempt of court, or injunctions such as prohibitions on logging, road building, and other activities that contribute carbon. HCN: You just presented your work at the annual Environmental Law conference here (at the University of Oregon). What was the reaction of the attorneys there? Wood: It was like a light going on, frankly, because it's a totally different approach. It's a macro approach to the problem. So far, attorneys have clung to the statutory claims that are most familiar to them. And those claims, like the Clean Air Act, or the National Environmental Protection Act, are fine for stopping individual actions that contribute carbon. But they are not going to reduce carbon overall in the time we have left. That is the most urgent matter. This approach underscores, or brings to light, an organic duty on the part of virtually every level of government. So the attorneys saw the power of that. Rather than suing every single government agency, just a few lawsuits declaring this would change the paradigm by which we are approaching climate. Suddenly, the pieces fall into place. Every government has to take its share of responsibility. Wood: Well, I've just launched the theory and I've provided the road map. I'm not going to be involved in any way in litigation because I'm an academic ... but I'm quite confident now that trust claims are going to be brought in the context of climate. How they (practicing attorneys) bring them is up to them. HCN: Any sense of when lawsuits will be brought? Wood: No, because I'm not strategizing actual litigation ... my thinking is that these lawsuits would have to happen soon in order to prevent society from crossing that final threshold. And I think attorneys understand that now. In other words, we are so close to a climate threshold whereby there will be runaway climate heating, according to the scientists, that we can't control. HCN: Given the science that says we have to be acting right now, is there really time for this legal strategy to bear fruit in two years or less? Don't lawsuits sometimes take decades? Wood: Lawsuits often take decades, but judges have the power to structure their lawsuits to provide expeditious or even emergency relief. Every judge has the power to organize his or her docket to address climate crisis with the urgency that it demands. And my own feeling is that there will be judges out there who recognize that they are part of the third branch of government and that our government is sending the entire world into disaster by not dealing with climate. So there will be judges there that will accept this responsibility. HCN: So you actually believe this is a realistic approach and that this could help to prevent climate meltdown as you call it? Wood: Oh, I do. But I would never say that this is the silver bullet. Because, as Bill McKibben has said ... if climate is to be solved, it's going to be solved with silver buckshot, not with a silver bullet, and this is my buckshot. This is just one little buckshot, but it's my buckshot, and it's something people hadn't thought of. Carla A. Wise is an environmental writer and conservation biologist based in Corvallis, Oregon.